Jasper is the last stone mentioned in the Bible in the High Priest's breastplate (Exodus 28:20). It comes from the Hebrew word yashpheh (Strong's #H3471). It is also the name of the sixth stone that adorned Lucifer (Ezekiel 28:13). The root of the word means to "polish" and both Strong's and BDB translate the word as Jasper. Yashpheh is translated "jasper" in Exodus 28:20 and Ezekiel 28:13 in all ten of the Bible translations used in this series. In the New Testament, the first foundation stone in the New Jerusalem (Revelation 21:19) is called in the Greek iaspis (Strong's #G2393). The book of Revelation records several visions given to the apostle John, one of which includes jaspers in relationship to God's appearance on his throne. In relation to this the Bible states the following. After these things I (John) looked, and behold, a door opened in heaven . . . And immediately I was in the Spirit; and behold, a throne was set in heaven, and one was sitting on the throne. 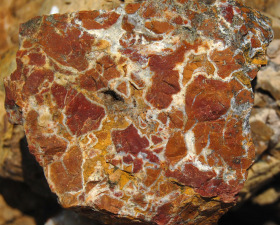 And He Who was sitting was in appearance like a jasper stone . . . (Revelation 4:1 - 3, Holy Bible Faithful Version). What is beautiful to God? The hidden numbers of Revelation! Why does God create a New Jerusalem? Jaspers are considered an opaque variety of Chalcedony stones. The most common colors found in them are red, green, brown or yellow and they can appear flamed or striped. The precious stone found in the priest's breastplate was likely colored "emerald-green" (Gemstones in the Breastplate, page 33). A 1911 Encyclopedia Britannica section on jasper states the following concerning the possible ancient color of this gemstone. "The jasper of antiquity was in many cases distinctly green, for it is often compared with the emerald and other green objects. Jasper is referred to in the Niebelungenlied as being clear and green." In ancient times, jasper was credited as a rainmaker. It was also thought to stop the hemorrhaging of blood. In the fourth century, the stone was thought to drive away evil spirits and to protect those who wore it from venomous bites. If a lion or an archer were carved on a jasper stone, it would protect the wearer from poison and cure them of fever (Curious Lore of Precious Stones, pages 6, 90 – 91 and 133). Is it a sin to have a transfusion?